Gorjuss is a little mouthless girl designed by Suzanne Woolcott, an artist living in Glasgow. It is also a trademark of Santoro. 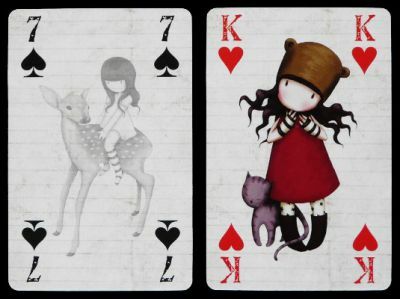 A large range of dolls, stationeries, mugs, bags, and so on has been produced including one pack of playing cards. All cards are illustrated and that's 53 different illustrations (the both jokers are identical). Without mouth, the Gorjuss looks expressionless, more like a doll. This might be the reason she has been chosen by Santoro. A neutral character fits a larger public. Price and where to find: I bought one in a bookshop of Rouen for 7.20 €. £5 in www.santoro-london.com.